Nov 8-11 The Downtown Chicks, a committee of the Downtown Great Falls Association, in recognition of Veterans Day is hosting Military Appreciation Days in Downtown Great Falls. Active duty and retired military, and their family members, are encouraged to look for the flyer posted in windows throughout stores and restaurants downtown beginning Thursday, Nov 8th and running through Saturday, Nov 11th. On November 24, 2018 Downtown will be celebrating Small Business Saturday, in honor of all our local businesses! American Express started this fantastic initiative in 2010 and it has been going strong ever since. This Holiday Season, think local, shop local. Nov 24 6pm. Join the Downtown Association in kicking off the Holiday Season with the Parade of Lights. After traveling down Central Avenue, the parade will culminate with the lighting of the Downtown Christmas Tree by Santa Claus himself! “Light up the Season” at the 35th Annual Christmas Stroll in Downtown Great Falls. Enjoy live music, food and many festivities up and down Central Ave. Stores and restaurants will be open late, stop in and get a head start on Christmas shopping! Button’s may be purchased at many downtown stores for $5 each- prizes for the buttons will be announced after the stroll. This year’s event is Feb. This year’s event is Feb. 15-24 and participating restaurants will showcase their talents with handcrafted menus at a fixed price. All participating restaurants and their menus are listed at www.GreatFallsMontanaRestaurantWeek.com. Restaurant Week is an opportunity to experience all the flavors Great Falls has to offer through its variety of restaurants. This event is a unique way taste our place as the menus come with a set price for both lunch and dinner. Come out and celebrate Saint Patrick’s Day with the Ancient Order of Hibernians at our Annual Parade in Downtown Great Falls, **SATURDAY, March 16th**! Our Grand Marshall, Dr. Bill McGregor, a long-time Hibernian, and a doctor and member of the Board of Directors at Benefis Hospital, will lead the parade starting at **1:30 pm**, in front of the Civic Center. To join us in the parade the **day before** Saint Patrick’s Day, please download, complete, and mail in a registration form found at: www.aohgreatfalls.wixsite.com/aohgf . Questions? Please contact: Rory Schulte, 406-899-9245, or Gerry Boland, 406-799-6837. Join us March 20-24, 2019 for Western Art Week, when Great Falls becomes the Western Art Capital of the World! With over 17 shows and more than 750 artists, Western Art Week provides a unique experience only found in Great Falls. A complete list of events by day will help you experience every live music performance, quick draw, auctions, and art, from oil, watercolor, and sculpture in the classic style to modern contemporary interpretations, bright, vivid and colorful. Interact with the artists in their showrooms and marvel at their skill witnessing them create custom works at several quick draw events, engage in a variety of events including quick finishes, live auctions, and educational symposiums. An all-art adventure awaits, with art for your personal style at every price point. You will find artwork that captures alluring landscapes, rugged independence, tenacious adventures, and majestic wildlife. You will find original oil paintings, giclees, bronzes, photography, furniture, sculptures, jewelry, watercolors, prints, pencil sketches, scratch boards, pastels, and more! Support Local! Join the fun on Saturday, April 6th as we “Mob” a downtown business with our cash in hand. We will meet at 5th and Wine at 10:30 for coffee, mimosa’s and a bite to eat if you’d like. We will announce which Downtown Association member business we will mob at that time! There are 3 simple rules: 1. You must spend at least $20 2. Meet 3 new people you did not know before 3. HAVE FUN! Spring is here, let’s have some fun downtown. The 40th Annual Ice Breaker Road Race will be held Sunday, April 28, 2019. Join over 3,600 runners, joggers and fitness walkers who enter the race each year. Participants range from recreational walkers, families enjoying an outing, to serious competitive runners. The five-mile road race offers a competitive format; and the three-mile run offers both a competitive and recreational format. Pacer the Penguin will be entered in the one-mile race and will be challenging kids of all ages. Register the entire family in the one-mile jog and fitness walk and take advantage of our special family rate. Registration begins March 11 and is Monday-Friday, 8 a.m. to 5 p.m. at the Park and Recreation office at 1700 River Drive North. Special registration will be held at Scheels in Holiday Village Mall on Saturday, April 13, 10 a.m. to 4 p.m. Registration moves to the Civic Center Convention Center on Saturday, April 27, 10 a.m. to 5 p.m., and Sunday (Race Day) at the Convention Center, 8 a.m. to 1 p.m. A late fee of $2 per registrant will apply beginning Monday, April 22. Register by April 21 to be included in the drawing for early registration. All participants who register during early registration will be entered into a drawing for two great prizes: Two bicycles, donated by Pepsi, valued at $200 each; and a three-month membership from the PEAK Health and Wellness Center, $174 value. The last opportunity to get in on early registration in person will be at Park and Recreation, April 19 or on-line Sunday, April 21. That is also the last date to register without paying the $2 per entry late fee. On-line registration is available at www.icebreakergf.com. Registration forms will also be available at Universal Athletic Stores and Scheels Stores throughout the State. Each participant will receive a 2019 Ice Breaker long sleeved t-shirt, a unique finisher medal, and lunch after the race. The Awards Ceremony will begin in the Convention Center at approximately 4 p.m. and will include prize drawings. A special thanks to the major sponsors including Pepsi, Benefis Health System, Blue Cross Blue Shield of Montana, Great Falls Tribune, and Walker Design Group. Without these sponsors, the race would not be possible. Additional sponsors including ABC Fox Montana, Scheels, NorthWestern Energy, Peak Health and Wellness Center, Universal Athletics, City of Great Falls Public Works, and MAFB are also contributors to the success of the race. Come on Downtown on May 4th to celebrate 20 years of Cruisin’ the Drag! Central Avenue will be lined with classic cars and trucks, and a few of the new-age hot rods. Grab some food from the vendors and walk around downtown! The Downtown Chicks will be hosting the Semi-annual Downtown Military Appreciation Days May 16-18. The following poster will be up in store and restaurant windows of the businesses who are participating or offering a discount, sale, or other fun promo during this week. Check back for a list of participating businesses! Join us on Central Ave as we string lights, play some music, eat some food and do a lot of shopping at the Downtown Night Market on May 24th from 5 – 8pm. This is a family friendly event with kids activities, craft vendors, art demonstrations, and more. 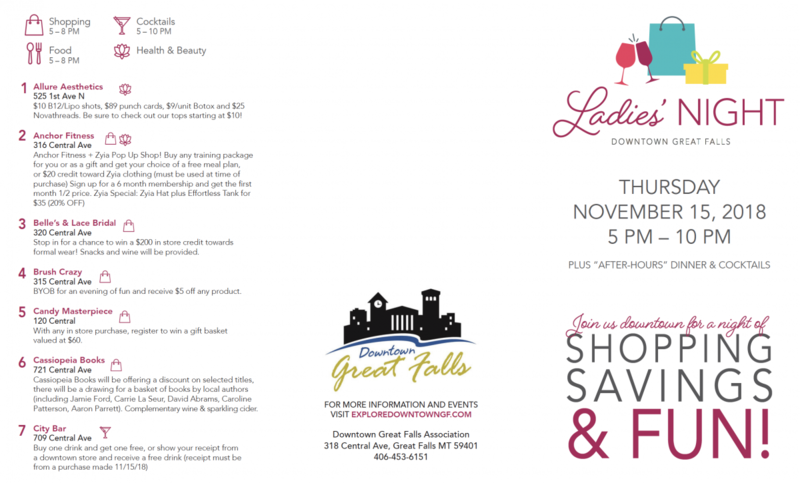 For vendor information please email Kellie at info@downtowngreatfalls.net. The Downtown Association is the host of Craft Beer Week in Great Falls, happening June 2 – 8, 2019. The week will be filled with fun activities, education sessions, tours and more that are all centered around the Craft Beer Culture in our community. The week kicks off with the Craft Beer Obstacle Challenge at Gibson Park on Sunday, June 2nd and wraps up with the MT Brew Fest at the Mansfield Convention Center on June 8th. During the week there will be Dinner and Beer Pairings at local restaurants, Firkin Tappings (special small batch brews) by our local breweries, trivia nights, an Olympic Beer Challenge, tap takeovers and more! Visit www.gfcraftbeerweek.com or the Great Falls Craft Beer Week Facebook Page for up to date info and registration information.